The contentious plantation, by Sud-Cameroun Hévéa S.A (hereafter Sudcam) involves the conversion of about 45.000 hectares of natural forest into rubber plantation. The concession is just a few hundred meters away from the western border of the World Heritage Conservation site of the Dja Reserve. Created in 1950, the faunal reserve was declared World Heritage by the UNESCO in 1987due to its exceptionally rich biodiversity. The project could affect endangered species such as chimpanzees, forest elephants, western lowland gorillas, and a nearly extinct leopard species. According to a 2018 article by Global Forest Watch, this is one of the forest regions at risk right now . Only from November 2017 to March 2018, they have found that 1.000 new hectares of tree cover were affected. 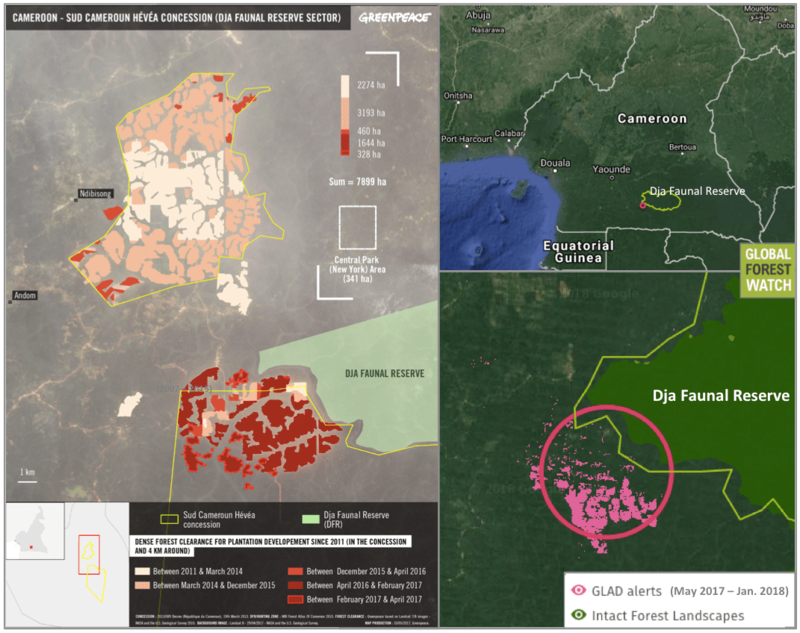 According to Greenpeace, the Sudcam plantation is “the most devastating new clearing of forest for industrial agriculture in the Congo Basin” . Besides, there is a conflict with the population about the property of the land, as many people don’t have formal titles of property and rely on the customary access rules for their subsistence farming. In this area live about 9.500 people, most of them belonging to the Bulu tribe, (Bantu group), but there are also people belonging to the indigenous Baka Tribe. The latter are traditionally hunters in the forests, so they are particularly impacted by the change of land use. On the other hand, residents have claimed that subsistence farmland has been taken away from them without any (or very little) compensation. According to a Greenpeace Africa forest expert, Sylvie Djacbou, talking to Mongabay, the Baka are also suffering the destruction of graves and sacred sites which were very important for them. The organization Rainforest led a community mapping action in the area, which “has shown widespread dispossession of community lands and resources, including those of indigenous Baka people”, a specially protected community . Besides, communities claim that “there has been wholly inadequate compensation, provisions to protect their livelihood, and no benefits from the plantations”. The legitimacy of this plantation is very doubtable, since there is no transparency on how they got the authorization to exploit that land. In fact, key information about the project, such as all the limits of the concession, the land rent, information about the owner, the actual investment made so far, are not made public. By the end of 2015, the UNESCO failed to inscribe the Dja Reserve on the List of World Heritage in Danger and highlight the threat that Sudcam represents for the ecosystem of the region. Overall, due to widespread corruption, an autocratic political regime, constant involvement of the ex-colonial power and little transparency, it is extremely difficult for people in Cameroon to obtain recognition of their rights. Project Details The land concession approved by presidential decree in 2008 granted to Sud-Cameroun Hévéa S.A (hereafter Sudcam) about 45.000 hectares in total . The concession has been divided between various uses: 30.000 hectares for the rubber plantation, 500 for nurseries and 375 for worker’s camps. About 9.000 hectares of the concession are deemed to be unsuitable for plantations, so they are used for conservation. There are concerns that Sudcam might be working also out of the concession, although this point is not yet clear. Sudcam is a joint-venture between the Société de développement de caoutchouc camerounais S.A (hereafeter SDCC) and the Cameroonian company the Société de production de Palmeraies et d'Hévéa S.A (SPPH). SDCC is a subsidiary of Cameroon Holdings Pte. Ltd, itself also a subsidiary of GMG Holdings Ltd. The company said to be committed to also build social infrastructures in the area (schools, health centers, accommodations, etc. ), rehabilitating the existing village plantations and promoting the creation of new ones as well. The heralded aim of the project was to stimulate the economy of the country by increasing the production of rubber and creating jobs. However, since 2011, the installation of the plantation has locally meant a massive forest clearance, (the most important in the Congo River Basin), and it has triggered a lot of social discontent among the local populations. The forecast is that the entire 45.000 hectares would be planted by 2029, and the company has already announced its intention of building a factory to transform the rubber into latex . Development of Alternatives There are different proposal to mitigate the negative impacts of the project. The Africa Wildlife Foundation talks about the possibility of developing wildlife corridors between plantation blocks, and creating buffers around wetlands and streams. Greenpeace Africa has urged the Cameronian government to stop the contract with SudCam and has publicly denounced to the UNESCO for not protecting the Dja Reserve. They ask for more transparency and, specially, that the company does the Free, Prior and informed consent process in a proper way. The NGO has at least asked for the suspension of the activities until there is: a complete transparency about the land acquisition; reparation for the damages on populations; and a participative management decision making process involving the local inhabitants. Why? Explain briefly. There hasn´t been any sign of change from the company nor the Government since 2008, despite the petitions from different organizations to halt the project. The local inhabitants still don't have any information about the land acquisition of Sudcam since the procedure hasn't been respected. The project is imposed to them, with all the consequences it will bring and already did on both the environment and their lifestyle. Moreover, although Greenpeace (2016) requested the government to suspend the project until it complies with a transparent and reliable procedure to ensure free, informed and prior informed consent of local communities, the State doesn't care. "Socioecological responsibility and Chinese overseas investments: The case of rubber plantation expansion in Cameroon". Assembe-Mvondo, S.; Putzel, L.; Atyi, R.E. "Etude d'impact environnemental du projet de création d'une plantation agroindustrielle d'hévéa dans le Dja et Lobo, Région du Sud" environmental study by Sud Cameroun Hévéa S.A.
 UNESCO fails to protec Cameroon's Dja Reserve from multiple threats including the Sudcam Rummber Plantation. Conservation watch, 28.06.2016, "En péril : la réserve du Dja au Cameroun et la crédibilité du système du Patrimoine mondial de l’UNESCO"
Journal du Cameroun, 07.07.2017, "Philip Ngolé Ngwese dément les accusations de Greenpeace sur la déforestation dans la réserve du Dja"